This is a big challenge for most of us to come to terms with during any weight loss journey. Everybody reacts to nutritional change and fitness differently. My pushups may make different muscle changes on me than your pushups do on you. But it’s really hard to remember that when someone lost twice as much weight as you did in the same amount of time. Why can she lose weight so fast and I can’t? Keep it sane. 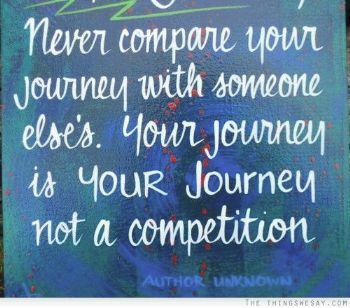 Don’t compare yourself with others weight loss paths. Keep positive. Support yourself and congratulate others. Your journey is your own! I do not feel like adding to the above words of encouragement during the challenge for this week because it really worked for me. The challenge for week 6 is called "Amazing Race", it is more of a race because we are made to do a week of the weekend challenge instead of 4 days. The tasks started on Wednesday and ends Tuesday. The task is actually like the reality TV show Amazing Race, but instead of running round the world we accumulate fitness minutes to go to islands around the world [I did not leave Nigeria, though]. There are 20 islands to be hopped and you can only get to an island after 20 minutes of exercise i.e. if you workout for 40 minutes you will cover two islands, if you exercise for 60 minutes, you will cover three islands etc. If you however do 30 minutes of exercise, you either add a 10 minutes or leave the 10 minutes out because it expires for that day, you are not allowed to carry any extra minutes forward till the next day. You can imagine what we all had to go through to cover all the islands, that will be over 400 minutes in 7 days. I had to change my routine [because I had more HIIT] to dancing and walking so that I can add more minutes without tiring out [thank God I did]. And for the first time since I had participated in the Amazing Race [more than 10 races], I FINISHED. Well, during the week I saw this journey as mine. I am not competing with anyone, I had to do this since no one can do it for me. I had to encourage myself even when I felt sore all over, I could only tweak my schedule to make sure I kept moving. It applies to life matters too, we have to keep keeping on. No Waiting! No Loitering! No Parking! Keep Moving! Or you risk a fall and a hard fall too [because others are moving]. Things may not be smooth but you need to keep moving, keep busy, write plans, actualize plans, dream big, show up, help others and I can assure you, you will be nearer to your life's ambitions than it was yesterday. I have decided to encourage myself and believing that someday soon, all will be well and those things that looks far off right now will be at my doorstep including my goal weight among other things. So I challenge you to make this journey your own. You can't travel my journey, so be strategic on what will ease this trip for you and dive into it, please do not quit [I feel so most times too but I know I won't] and we shall meet at the top of the ladder. Below is a stretch/flexibility graphic from Pinterest that helped me last night, I woke up like a baby this morning. I weighed in at 165.4lbs this week, that is a loss and I am maintaining status-quo for this coming week, I will work as hard. I have a 414 fitness minutes on my badge this week and I feel quite proud of me, in fact I have all reasons to have a gain this week but I think I killed it with daily workouts. I pray that the tempo continues for the week ahead.